I have seen the pictures from our high flying Husker astronaut Clay Anderson, and was wondering how we could compete with his venue. As we were starting to listen to the Husker Spring Game on the internet from our house in Palm Coast, FL, Rosie asked if there was way to bring the computer out to the pool area so we could "float" and listen. With a bit of heading scratching, and some long cables I was able to bring the computer pool side. 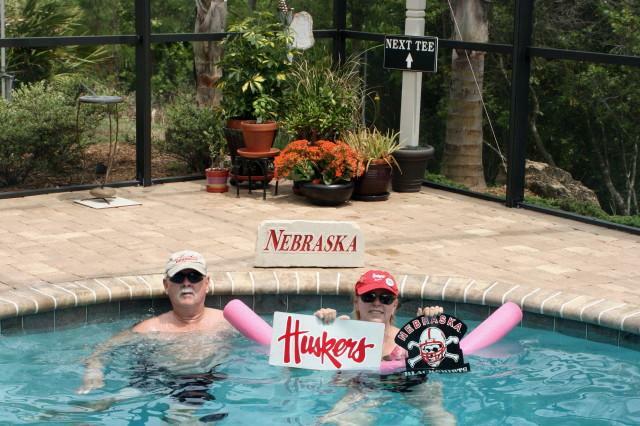 Listening to the game while in the pool was our "southern Husker experience," and was most enjoyable. We brought a few Husker signs into the pool, along with our Husker Gameday hats ! !